My involvement with a provincial math executive presented me with an interesting task recently. Like most tasks, I turned to get some input from the strong contingent of math teacher tweeps. A building task where students need to develop a structurally sound building out of a certain amount of newspaper and tape. A very interesting activity where solutions to questions refer to coordinates of a grid overlayed on a map. The students would then be directed around the university campus using a Cartesian plane. Another building that needed to be constructed on a budget. Differing materials range in price and efficiency. I wanted the activity to include explicit mathematics. These students are all quite gifted, and I wanted them to be able to link an overarching mathematical concept to the activity. I felt that the building challenges did not offer that. The budget element did provide a very interesting twist, but was too difficult to set up on short notice. I also didn’t want the mathematical element to be in the form of explicit math questions. I wanted the math activity to be an interesting break from the formal testing that the students did the entire morning. This meant that the Cartesian grid option was eliminated. (Although I plan to develop this at a later date). I was left with the scavenger hunt. Traditionally, scavenger hunts are a series of multiple choice questions. Each response moves the team, but they have no idea if they are right or wrong until they either finish the hunt or repeat a question. 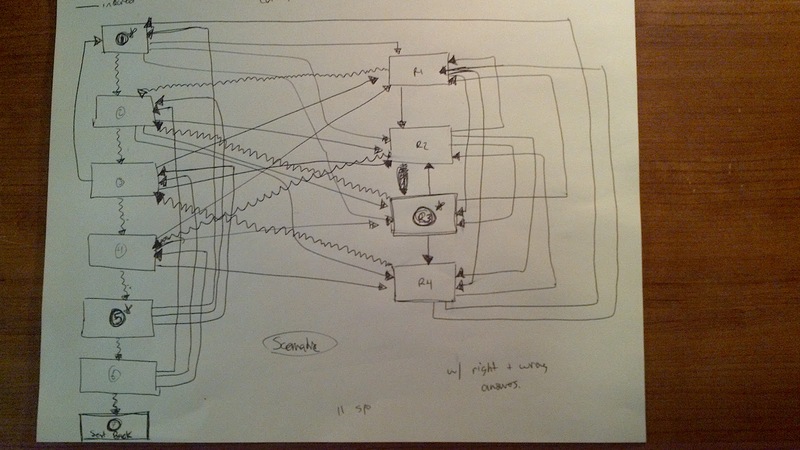 I began to draw this framework out; it became complicated quickly. In the diagram below, a squiggly line represents a correct answer and a solid line represents an incorrect one. There is one correct and three incorrect from each question. It would take six consecutive correct responses to complete the scavenger hunt. It’s a total mess. It did get students moving, but it still relied on the traditional “question-driven” hunt. I began to grow fond of the complexity that went into a hunt like this. A fairly simple concept has a fairly elaborate mathematical underpinning. Then the idea hit me, what if the framework was shown and the task was to decipher it? Enter the idea of the “Questionless Scavenger Hunt”. I created a map of a possible scavenger hunt with the possible interactions between “questions”. I simplified the process by including 9 “questions” with 3 “responses” each. The goal of the activity is now to use logic to determine which “question” fits in which slot on the map. Every question has it’s possible destinations listed on a card. The cards were placed in a certain room on campus. The goal can then be re-defined as trying to determine which “room” goes where on the map. I included 2 anchor rooms on the map. They will serve as the starting point (Room 1) and a reference point (Room 5) throughout the activity. Students are given the Room 1 card with the names of the three possible rooms they could be sent to. These three rooms are represented on the map by the rooms that have an arrow pointing to them from Room 1. From there, students need to move around rooms collecting cards of the possible connections from each room. 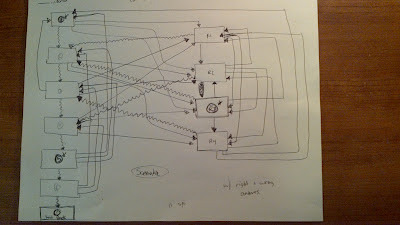 To complete the hunt, they must be able to arrange the remaining 7 rooms on the map so all interconnections work. Here are some pictures of the files that can be downloaded here. Various strategies could be used to complete. Groups may just collect the cards from each room and then sit down and try to puzzle it out. Other groups may use a process of elimination. If they pick up a card from Room 3 and it does not list Room 1 as a possible destination, than any space that has an arrow pointing to Room 1 can’t possibly be Room 3. The result should be an energetic twist on a classic favourite. I am expecting students to come with correct answers. (These are very gifted students). I plan on challenging them to prove that their solution is unique. If students claim it is impossible, I will question them as to why. Every mathematical step needs to be justified. The materials can be customized to your situation. Choose a starting room and replace “Room 1” with the name or number of that space. Do the same thing with 8 other rooms around your building. I altered my activity to fit the Arts building of the local university. If you wanted to implement it on a smaller scale, set up nine “stations” around the classroom. Put a stack of cards at each one, and students could move around the room looking for logical connections. This was a great learning experience for me. I struggled with the possibility of creating a puzzle with a viable solution. I often learn the most mathematics when I am trying to create meaningful experiences for my students. I would like to see a possible “Questionless Scavenger Hunt” with more than 9 stops. That is the challenge if you choose to accept it. Cool networking problem. I'd love to see some student results. I wonder how long it will take these talented students to work out the problem once they gather the cards. Given the right (possibly divergent, definitely non-linear) minds, I suspect some will be able to reasonably quickly logic out solutions. – For the room locations, are you going to announce in advance that there are exactly 9 rooms, or will they need to go to the 2 anchor rooms to get the cards identifying the other rooms? The latter seems more entertaining to me, making one of the challenges to figure out how many rooms are involved. Once a team can report that out to "problem central", they can get the "map" and start reasoning. – Given potentially quick solutions, I suggest having a back-up problem or two ready in case of rapid solutions. I haven't investigated your map very closely, but one back-up could be determining whether this problem has a unique solution. Assuming it is a unique solution, could they re-define a 9-room, 3-question map whose solution was not unique? The students will be given the map with the rooms on it at the beginning of the activity. They should be able to deduce how many more rooms their are. They do not know where they are however. They will have to run/safely walk around campus until they have collected the remianing 8 cards. (Anchor Room included). I am not sure how long gifted students may take, but, as mentioned in the post, my extension will be one of uniqueness. They can prove that theirs is unique, and then use their assumptions against themselves and build a model that is not. I love that idea!! I was just going to get them to reason, but creating their own will be great. Thanks for the input. I think I will make a series of blank 9 room, 3 choice sheets to test the uniqueness of solutions. Fabulous. Thanks for sharing! I am going to use it the first week of school for my "Advanced Apps" 8th graders to get them collaborating in small groups. I just changed the word "room" to "closet" and I will label the closet doors with envelopes/cards in our building so the kids don't have to bother anyone in any room. I'll be back to report in Sept.